The core purpose of SparkPost is to help developers easily send email from within their web and mobile applications. To help developers accomplish this goal, we have released the SparkPost Sending Domains API to help developers programmatically manage their SparkPost Sending Domains. Sending Domains are a way to map and authorize SparkPost to send email on behalf of your domain (example: myawesomedomain.com). This is accomplished by updating your domain’s DNS configuration to add specific SparkPost TXT records. These records provide proof to ISPs (Gmail, Yahoo, Hotmail, etc…) that you have authorized SparkPost to send email to your subscribers on your behalf. You can read more about the SPF (Sender Policy Framework) and DKIM (DomainKeys Identified Mail) TXT records in DNS here SPF and DKIM. Until now, SparkPost developers needed to configure new sending domains through the SparkPost User Interface. As of today, we are pleased to announce that we have added the Sending Domain APIs to SparkPost and updated our API documentation to reflect this new addition. 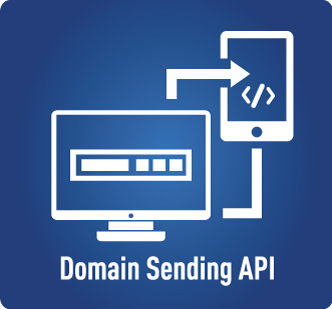 The new Sending Domains API gives SparkPost developers the ability to easily create, retrieve (individual and collections), update and verify sending domains programmatically. Read the complete Sending Domain API Documentation. This will allow developers to much more easily configure and maintain their sending domains — let us know what you think!